For Cronic Diarheas A tin full of flower [soak?] in a rag. 3 hours then take the inside wich is yet dry & make a [brey?] 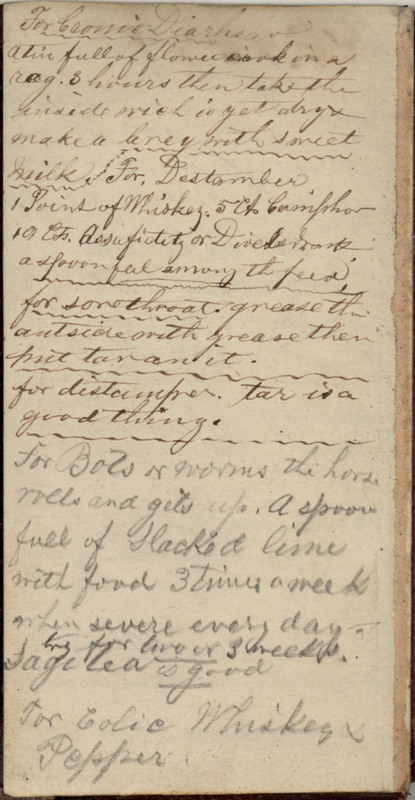 with sweet milk _________________________________ For Destember 1 Point of Whiskey, 5 ct Camphor 10 Cts. Assafidity or [Divelsmonk?] a spoonful among the feed _________________________________ For sore throat, grease the outside with grease then put tar on it. _________________________________ For distamper, tar is a good thing. _________________________________ For [Boils?] or worms the horse rolls and gets up. A spoon full of Slacked lime with food 3 times a week when severe every day. try for two or 3 weeks. _________________________________ Sage tea is good. _________________________________ For colic, Whiskey & pepper.